The P-Series mast climbing platform is the perfect tool for smaller jobs that require high capacity or for restrained work area where most climbing work platforms can't fit, whether for new construction or restoration. With its high load capacity (6,000 lbs at 28' length) to size ratio, it is ideal for multi-residential or small commercial masonry jobs between 15' and 100' in height. 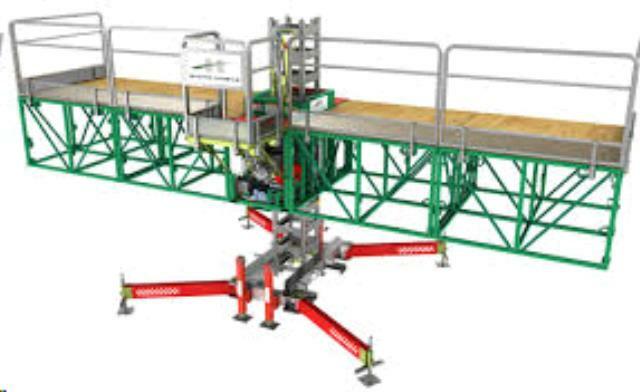 Fast two-person hand assembly of platform up to 28' (8,5 m) wide. 6000 lb load capacity provided by innovative hydraulic system. Expandable up to a 7' wide work area, reducing risk of injury. Platform can fit in a 36" opening. * Please call us for any questions on our hydro mobile lift p series rentals in Fort Madison IA, serving Southeastern Iowa and Western Illinois.